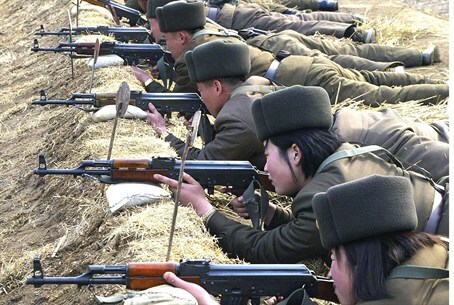 Military drill gone awry raises tensions in Korea on Monday. Will it turn into war? Live fire was exchanged between North Korea and South Korea on Monday, after a North Korean maritime drill strayed into South Korean waters. The semi-official South Korean news agency Yonhap reported that the North had begun the drill just after 12:15 pm local time. The Joint Chiefs of Staff (JCS) confirmed that North Korean artillery shells landed in South Korean waters, and that the South responded with live fire. "Some (North Korean) artillery fire landed in (the) southern part of Northern Limit Line - but in the water," a South Korean Ministry of Defense spokesperson told CNN. "We counter-fired over the Northern Limit Line." The official denied that South Korea fired directly at North Korea, merely saying "we fired at the sea." The tests were pre-scheduled, according to the news agency, with Pyongyang sending a fax Monday morning telling Seoul to "control" its vessels in the Yellow Sea during the drill. Wee Yong Sub, South Korean Defense Ministry vice-spokesperson, noted that the announcement still presented a North Korean threat. "We consider such announcement as a hostile threat and so have activated crisis management operation in case of (military) provocation," he said. "We stress that we are fully prepared for all situations." Tensions between North and South Korea have remained high for decades, after a de facto cease fire was formed by the 1953 Korean Armistice Agreement. Concerns have been raised over Pyongyang's nuclear abilities, human rights abuses, and militarism over the past several years, as fears remain that North Korea is capable of starting another - potentially nuclear - war.